COHEN CONCEPTS: 06.06 09:45 AM | For posting - Summer Registration for 501c3 WS at The Institute - Thank you! 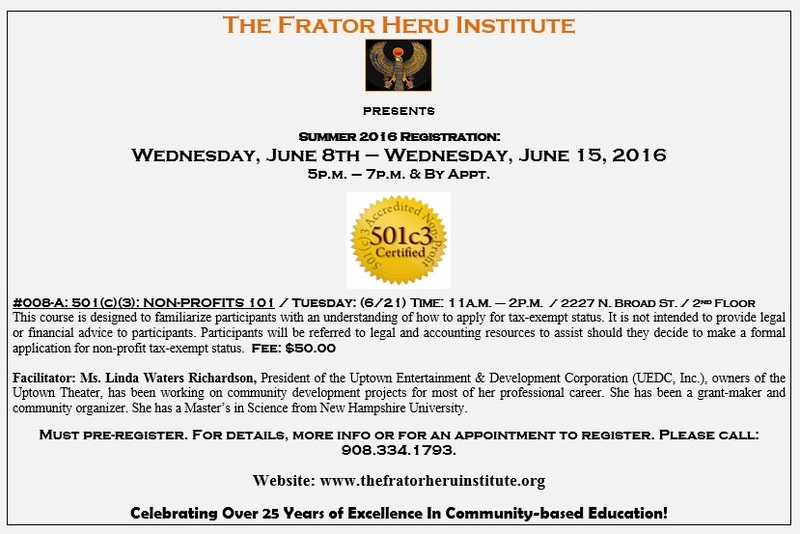 06.06 09:45 AM | For posting - Summer Registration for 501c3 WS at The Institute - Thank you! 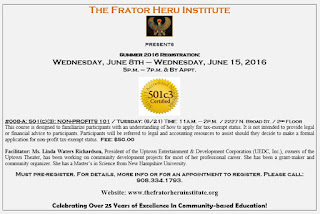 Subject: Re: [Community News] For posting - Summer Registration for 501c3 WS at The Institute - Thank you! 5p.m. – 7p.m. & By Appt. Facilitator: Ms. Linda Waters Richardson, President of the Uptown Entertainment & Development Corporation (UEDC, Inc.), owners of the Uptown Theater, has been working on community development projects for most of her professional career. She has been a grant-maker and community organizer. She has a Master's in Science from New Hampshire University. Must pre-register. For details, more info or for an appointment to register. Please call: 908.334.1793.